We met in the most modern and unexpected way – on a dating app! We both decided to put ourselves out there after years of dating doozies and didn’t expect much to come of it. Turns out, this little risk we both took ended up being the best decision of our lives. We started talking and became good friends, and eventually realized there’s more here than just a friendship. Our first date was 3 hours spent sharing our stories over coffee.. and we both knew that 3 hours just wasn’t long enough. We are opposites in the best ways, and love the differences between us. A morning person and a night owl means we will always have bright, joyful mornings and nights filled with laughter. Things have been so natural between us since day one, and over time we knew that this was forever. I had an idea that a proposal would be coming soon, but had no idea when. Joe and I had a nice date night planned – dinner at a lovely local restaurant then we’d spend the rest of the evening walking through the gardens. Turns out, Joe (and our families) knew something more was taking place. After dinner, we arrived at the gardens and started on our leisurely stroll. 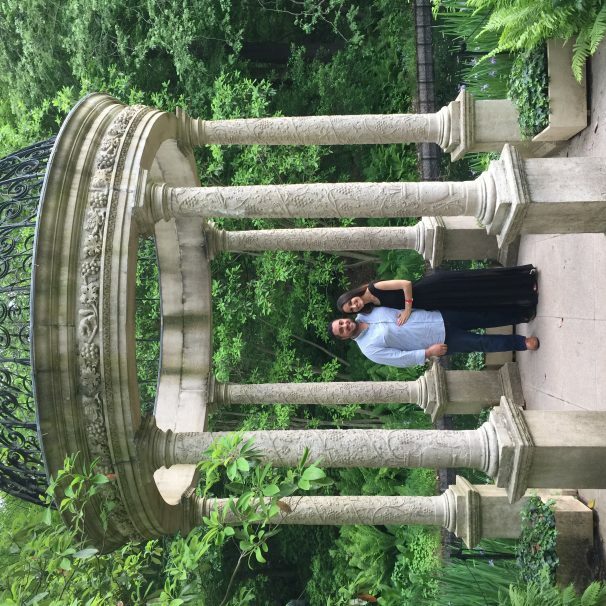 I thought we were just wandering, but my handsome now-fiancé was leading me to a beautiful gazebo. He shared with me his sweet words and got down on one knee. I couldn’t say YES fast enough. Afterward, our parents met us for fireworks and celebration. It was the most memorable night, and I couldn’t be happier.